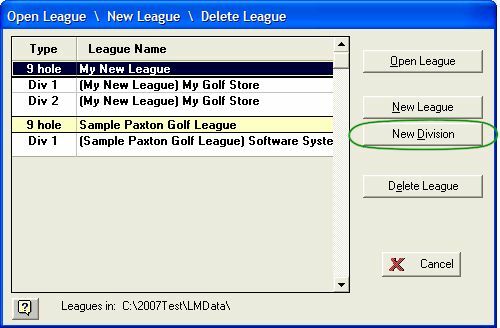 For those running League Manager for the first time, follow these steps to start a new league. If you don’t understand a menu option, see the following pages of this help manual for a detailed description. Select “Create New League” from the League menu. The “Open \ New League” form will appear. Click the New League button to create a new league. If you play 9 holes (front OR back nine) each league event, you have a 9-hole league. If you play 18 holes (front AND back nine) each league event, you have an 18-hole league. Type “9” if you are creating a nine hole league and “18” if it is an eighteen hole league. The “Parameters for League” form will appear. Fill in the necessary information. Use the TAB key to move around the form and click [OK] when finished. League Name: The league name appears on the first line of each report. League Sponsor: The league sponsor appears on the second line of page reports. Number of Subs in League: The number of substitutes can be any number between 0 and 99. The number of subs can be changed at any time. Note: Individual leagues that play head to head match play...should enter one player per team. Note: If you have an individual league that plays against the course or field you can enter any number of players per team. The team a player is on is irrelevant (ignored) since you will only print out individual standings. Number of Teams: The number of teams can be any even number between 2 and 100. The number of teams can be changed at any time. Note: Individual leagues...the number of teams can represent the number of players in your league. Note: The number of teams must be even. If you have an odd number of teams, one team will act as a bye or as a ghost team. Number of Events for the Season: You can have 1 to 50 events per season. The number of events can be changed at any time. Click the OK button to create the new league. Click Cancel or press ESC to cancel. Is Your League Separated Into Divisions? “Baseball” type divisions. This is for leagues that do NOT have inter divisional play. Each division acts like a separate league. However divisions do share the same substitutes in common. This means a substitute can play in any division. If your league has these types of “Baseball” style divisions, click the New Division button and repeat step 2 for each division. “Football” type divisions. This is for leagues that have teams playing inter-divisionally. DO NOT create any new divisions! You will only have one division, which you will later break up into separate groups. The terminology League Manager uses for “football” type divisions are called GROUPS. The group/division each team is on will be specified on the Team form. See Entering Team Information for more information. Select the league and click Load or double-click the league name. Select “Course Library” from the Setup menu. The “Golf Course Library” form will appear. Click the [New] button to add a new course. The “Add Course” form will appear. Type in the name of the Course. Highlight the tee(s) the men will play on, in the tee box, and click the [Edit] button. The “Edit Tee” form will appear. Fill in all the information requested, ratings, slopes, yardage, pars, and hole handicaps. Click [OK] when done. Highlight the tee(s) the ladies will play on, in the tee box, and click the [Edit] button. Enter all information. Note: Courses can be accessed by any league you create and may be added at any time. Nine hole leagues can play on any number of 9 hole courses. Eighteen hole leagues can play any number of 18 hole courses. If you have men AND women in your league, enter both men and women’s tees for any course your league will play on. League Manager requires full course information for both men and women. It only takes a few minutes to enter the course information, and once done you never have to do it again. See Entering Courses for more information. Double click your mouse on the appropriate team number or click the Edit Team button. The “Team Information” form will appear. If you are running a league with “Football” style divisions, type the division\group number the team is on in the Group field. Press Enter or Esc to exit the form. See Entering Team Information for more information. Double click your mouse on the appropriate player space or click the Edit Player button. The “Player Information” form will appear. Enter the information for each player. At minimum, enter each player’s name and gender. The player’s address, phone number, handicap, flight, practice scores, etc…are optional. If your membership has played practice rounds, or you have a history of scores for your players, enter these on the "League Statistics" tab as practice scores to establish an initial handicap. See Entering Player Information for more information. 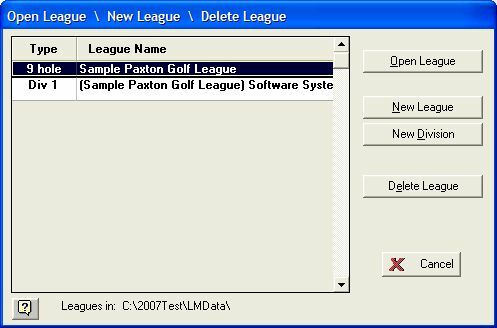 Note: If you do not enter any practice scores League Manager does have an option to calculate an “Instantaneous Handicap”. If you use substitutes, move to the Substitutes section at the very bottom of the list. Move to a blank position and double click to add/edit a substitute. The “Player Information” form will appear. Note: The first five substitutes in the list are called the “Ghost Substitutes”. If no human substitute is available, the opposing player may play against a Ghost. If you are entering hole-by-hole scores you will want to customize the Ghost parameters. See Making Substitutions for more information. To customize the league schedule, choose “Automatic Scheduling” from the Setup menu. See Automatic League Scheduler for information about setting up your schedule. To customize how handicapping is done, choose “Handicap Calculation Parameters” from the Setup menu. See Handicap Calculation Parameters for information about setting different calculation modes. To customize point calculations, select the “Point Calculation Parameters” option from the Setup menu. See Point Calculation Parameters for detailed information. If you use substitutes, you may want to customize the “Ghost Substitutes”. Double click each “Ghost” player to edit its parameters. See Making Substitutions for more information.